Grabbing headlines is still fairly easy for a CEO of a global top 250 company. You simply have to say something very provocative in the media. Sadly, this isn’t necessarily the same as saying something influential (e.g. providing thought leadership), career progressing, or even likely to be well informed. Blackberry used to be a highly influential mobile phone manufacturer; particularly among business people. For more than a decade Blackberry (or RIM, as they were formerly known) supplied the go-to mobile phone with email device handed out to millions of managers around the world. It was a status symbol for some. But that was way back then, more than 5 years ago. And 5 years is a relevant frame of reference for this particular post. Thorsten Heins, CEO of Blackberry has surprised people with his provocative prediction for the death of computer Tablets within 5 years. At least the ‘death of Tablets’ has been the spin applied to what he said in some media reports. What he actually said was also, in my opinion, equally wrong; but possibly for very different reasons. Before I go into what Thorsten Heins actually said, and why I believe this indicates why he is so out of touch that he will no longer be the CEO of Blackberry within the next 5 years. I’ll first demonstrate why I believe Tablets will still be around in 5 years. My argument is that once a media communications channel becomes commonly available, it generally continues to be available for decades, if not centuries. The chart below highlights this. Apologies if the scale on this quick graphic isn’t quite clear. 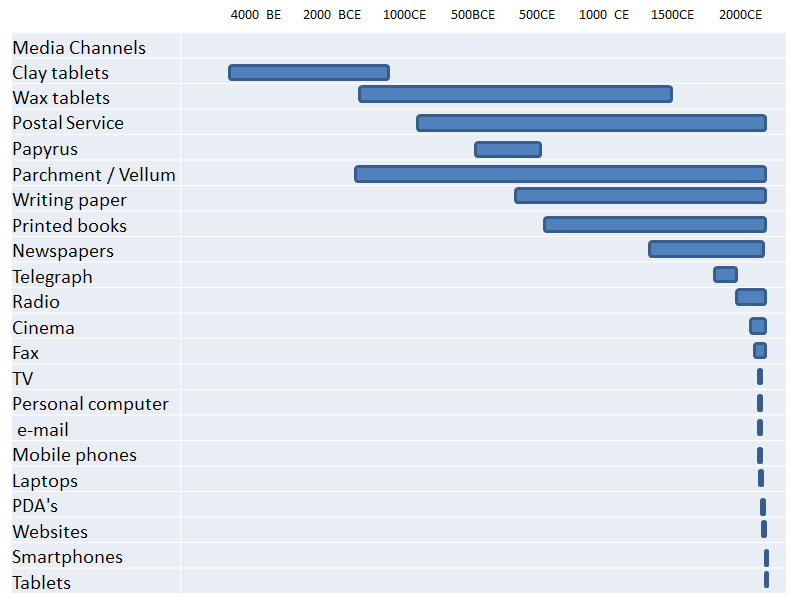 All of the media channels invented since the 20th Century CE/AD are all still present today. While the Fax may soon go the way of the Telegraph, virtually disappearing only a century or two since widespread adoption; as other communication technologies more conveniently and cheaply replace their role. The Tablet is very much growing and morphing into different but related forms that are still identifiable as a tablet. From The iPad, to the Kindle, to the Samsung Note. The Tablet is neither in decline, nor likely to die out in the next five years. Of course, the continuing rise in Tablet sales is not just my point of view. Gartner recently published information, based on actual sales data from 2012 and then their forecast to 2017. Sales are set to near double this year alone in their estimation to 197m units, then more than double again to nearly 468m units by 2017. Samsung Tablets, Amazon’s Kindle Fire and Apple iPad and iPad Mini quarterly sales reports also suggest confidence in Tablets outliving this decade. So what did Thorsten Heins, CEO Blackberry, actually say and what was he probably thinking? He went on to qualify this by suggesting people will use a big screen in their workplace, but not a tablet. This is the point that reveals how out of step he is with the consumer market place; but also reinforces his focus on the corporate customer for Blackberry. If we rewind over the past five years; Blackberry have been focusing more on extending their products into the consumer market place. The introduction of the Blackberry Pearl (2006), the Blackberry Curve (2007+) signalled this in mobile devices. But the launch of the Playbook, a true Tablet, in 2o11 was Blackberry’s gamble to break out of smartphones and into the wider technology hardware space Apple and Samsung successfully operate within. The Blackberry Playbook failed to attract a large enough share of the growing Tablet market (as did Motorola, Dell and HP; while Nokia scrapped their plans to launch a Tablet too). In part this was because the original Playbook device lacked key features. It required a Blackberry smartphone to pair with in order to access Blackberry email and calendar functions – the key reasons for owning a Blackberry device for many customers. The App store also struggled to offer a mere 25,000 apps after the first year from launch; leaving a poor comparison with the hundreds of thousands of apps available through Apple’s iStore or the Google Play app store for Android Devices. Sales of the Blackberry Playbook stalled at around 700,000 in the first six months from launch, but after heavy price discounting total sales since launch in 2011 eventually edged up to 2.3m by Q1 2013 (source Wikipedia). Before the discounting, unsold inventory made Blackberry take a loss in 2011 of $485m. The modest sales of Blackberry Playbook to-date compare unfavourably to the 34m sales of iPads sold in Q1 2013 alone for Apple, and 8.8m for Samsung, also in Q1 2013 (Source: International Business Times). So, my belief is that what Thorsten Heins really meant to say was that while the Tablet market continues to grow, it is very small compared to mobile smartphones. And as Blackberry have failed to find either a consumer audience, or a sufficient corporate market, that demands our participation in the Tablet sector. Blackberry will stick to making smartphones, particularly for business users. While new product launches, such as the recent Q10 smartphone, using Blackberry OS 10, adds a little newsworthiness back to Blackberry’s product range. The brand isn’t set for growth in volume sales or profits from my point of view. Particularly as the Q10 is priced significantly higher than the Samsung Galaxy S4, HTC One and the Apple iPhone 5. My forecast is that Tablets will stay popular for decades to come, but I don’t believe Thorsten Heins will continue in his CEO role at Blackberry for the next 5 months. quick visit world wide web and on world-wide-web I found this website as a best website for newest updates. i got here to go back the want?.I’m trying to find things to improve my site!I assume its good enough to use some of your ideas!! Hi my own family member! I have to state that this information is remarkable, awesome created including virtually all vital infos. I’m going to see a lot more blogposts such as this .